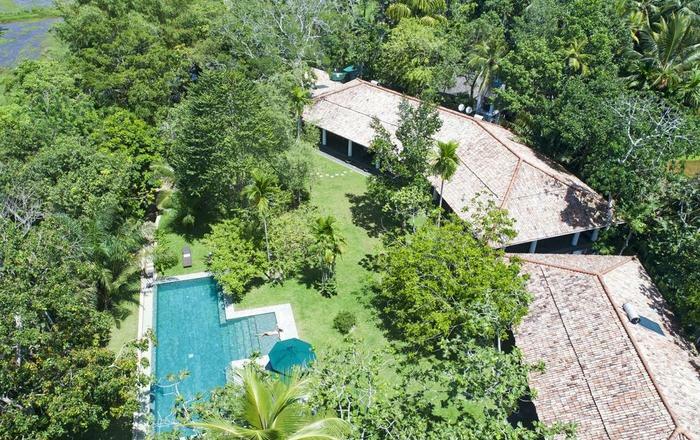 Suriyawatta family home is named after the two large Tulip Trees that shade the south facing lawn and poolside. 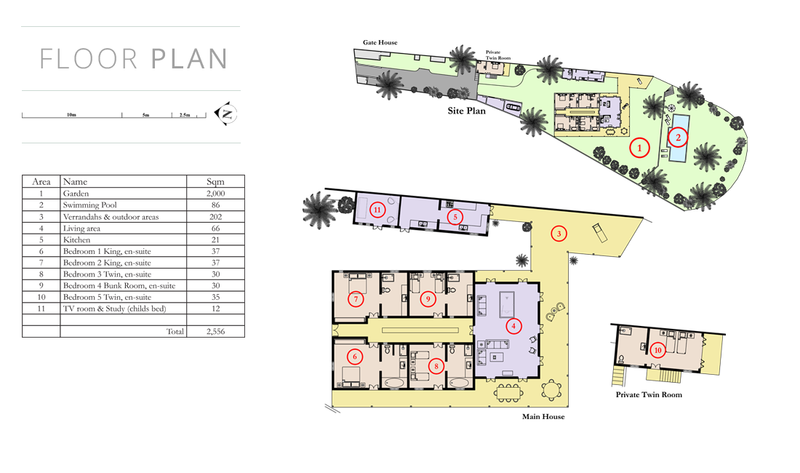 The 5 bedroom property consists of 2 doubles, 2 twin bedrooms and a 4 bed bunk room - all with ensuite bathrooms. 4 bedrooms are set in the main house and are centered around a courtyard while the 5th is located in a separate building close to the front door. The sitting room is fitted with entertainment facilities such as TV/DVD, surround sound etc. A terrace off the front t leads onto a small lawn with a child’s swing in one corner. 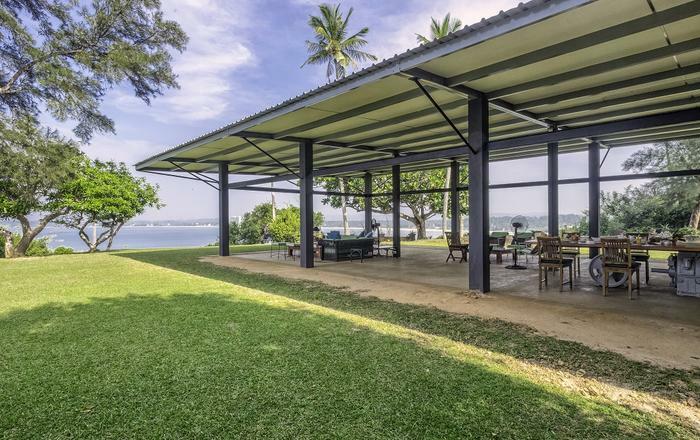 Suriyawatta has an open plan structure with French windows leading to terrace and garden and the ocean views beyond. The kitchen is inviting or can be left as the domain of the chef. The dining area has an impressive dining table with seating for ten. The master suite and the guest suite have four poster king sized beds while the guest twin suite has two 4 poster single beds. Bedroom 4 is also a guest twin suite with two 4 poster single beds while bedroom 5 is located in a separate building with two 4 poster single beds, which can be pushed together to make a double. 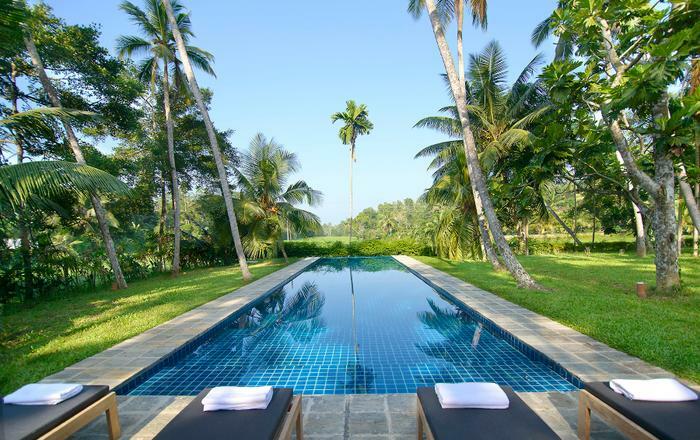 The lower terrace of Suriyawatta houses the pool. 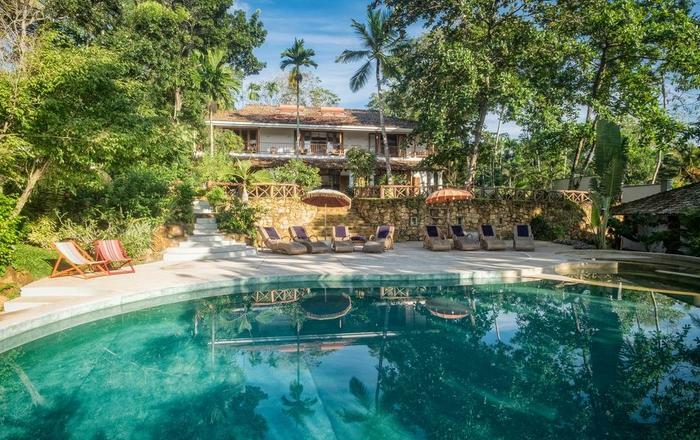 A few more steps lead down the garden and the private gate that opens onto a small beach and the lagoon that seasonally offers safe swimming and snorkling. The villa also has a boules court near its entrance. It is serviced by professional staff to take care of guests and ensure they have a unique and relaxing holiday experience. Guests travelling with kids will find the property to be very child-friendly. Baby cot, car seat and baby-sitting facilities can also be arranged if informed at the time of booking. 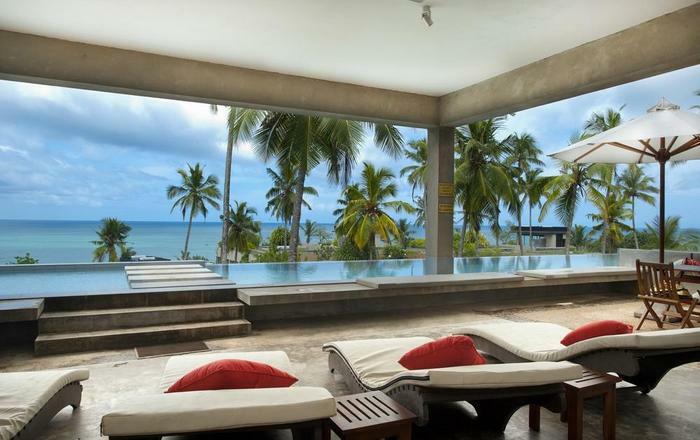 Prices quoted are in US Dollars, are listed by the Villa Owners and are subject to change without prior notice. However, once a deposit or payment has been received, the prices will not be amended for the dates of the rental. All payments are to be made in US dollars unless an exchange rate for other currencies has been agreed on prior to the payment being made. Bookings more than 30 days before the date of arrival will require a 50% deposit to confirm the booking. The full payment must be received 30 days (60 days if peak period) before the date of arrival. No reminder will be sent and failure to pay on time may result in a loss of the booking. Bookings made within 30 days of the date (60 days if peak period) of arrival, will require full payment. Once the deposit or payment has been received, a final booking confirmation will be sent. A security deposit equivalent of one night rent will be payable in US Dollars, in cash, on arrival at the villa. This deposit will be used against any damages or charges incurred during the stay. The difference or full amount will be returned in USD on the day of departure. If the charges cannot be determined at the time of departure, the Owner is entitled to withhold a reasonable estimate from your security deposit and will return any balance as soon as the actual cost has been determined. For cancellations more than 60 days before the arrival date 80% of the total rental amount, minus a USD 150 administration fee, will be refunded. For cancellations and/or amendments 30 - 60 days before the arrival date, 50% of the final booking amount, minus USD 150 in administration fees, will be refunded. For cancellations 1 - 29 days before the arrival date and for no -shows, no refund will be made. During peak periods, 30 days will be added to all cancellation periods. 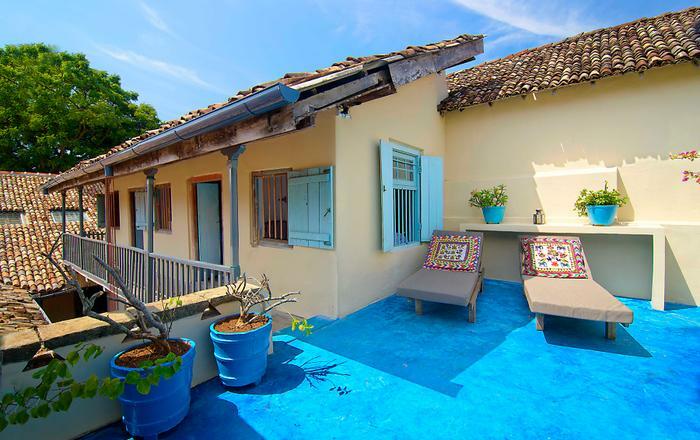 A refund may be offered, if the Villa is re-let for the same duration and at the same rates. 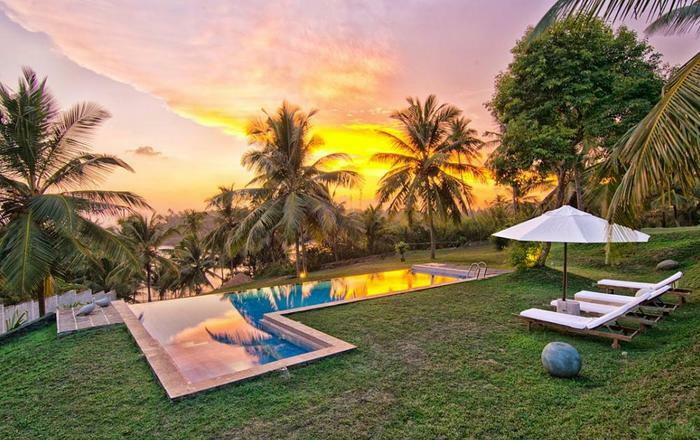 In the unlikely event a villa booking is cancelled by the owner, the owner will attempt to secure a booking in an alternative property of the same standard, at the same rates. If this is not possible, a full refund will be made.